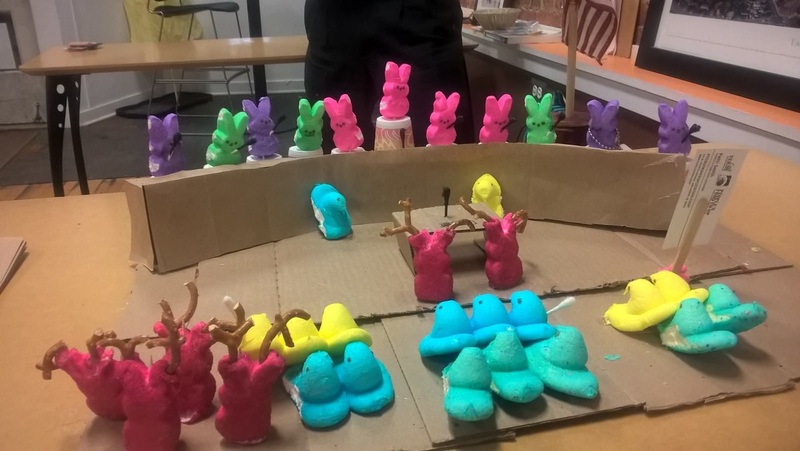 Ann Arbor's City Council recreated in Peeps. Photo courtesy of Patti Smith. As the old saying goes, "Ain't no party like a #a2council party cause a #a2council party has #a2council Bingo." Gentle readers, if you are so inclined, please join us for a viewing of the April 16th meeting of the Ann Arbor City Council. The viewing party will be at Workantile at 7 pm. You can RSVP for the event on Facebook if you like. Though meeting details have not been finalized yet, we do know there will be a reconsideration of the City's option to purchase the Y Lot from Dennis Dahlmann. This is probably the hottest topic on the agenda. There will also be a first reading of a Unified Development Code (UDC) which clarifies the city's zoning ordinance. If you've never been to an #a2council viewing party, this is your chance to meet all your friends city council twitter. If you have been, you know you won't want to miss #a2council Bingo. This event is BYOB, but don't worry, we will provide the Bingo cards.